Mark Oxley insists his rivalry with Hibernian’s prolific strikers has ensured the Easter Road club have developed a “ruthless” streak at both ends this season. Jason Cummings, James Keatings and Dominique Malonga have been hailed this season for spearheading a goal-laden campaign, with the capital club hitting the net 39 times in 20 games. While the strikers hog the headlines, Oxley is more proud of the club’s 11 shutouts, which included a fine run of five consecutive clean sheets during August and September. The former Hull City custodian is adamant the form of the club’s attackers is driving on the defenders. He said: “At times last year we were conceding sloppy goals and, at the same time, missing chances. “This season, with the players the manager has brought in up front, we have so many options in attack that a team is not going to know what to expect. “The manager can mix it up from week to week and the strikers have been superb. “With the boys in attack doing so well, the defensive part of the team is thinking ‘we’re going to shut the door and do our part’. That ruthlessness at both ends is how we are getting results. “Last season we conceded so many sloppy goals, and the manager recognised that. The first couple of games things didn’t go to plan but now everything has fallen into place. “It’s not just the back four, it starts with Jason [Cummings]. He recognises – every player does – that when we don’t have the ball they have to work to get it back. Oxley believes Hibs’ sparkling form on the pitch can be traced back to the camaraderie in the dressing room and, despite the squad being based in disparate locations, regular bonding sessions ensure a tight-knit feel. They embarked on a paint-balling session recently, while the group regularly go out for dinner together. Oxley believes head coach Alan Stubbs must take all the credit for piecing together an impressive “jigsaw” in the Hibees’ bid to return to the top flight this term. He continued: “There is not one person in the changing room you wouldn’t consider to be a friend, it’s a great place to be and we make sure we are doing everything right on the training pitch to make sure it goes well on a Saturday. “They are great lads and fair play to the gaffer bringing them in. It is a group that has fitted together like a jigsaw. Everyone has slotted into the right position. 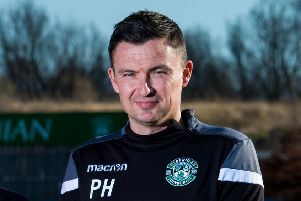 Despite Hibs’ recent run of victories, which now stands at a remarkable 14 wins from 15 games, Stubbs has warned that Falkirk cannot be counted out of the title race. The Bairns have hung onto the coat-tails of Rangers and Hibs in the Championship chase and will move to within three points of Stubbs’ men if they can claim a shock victory this afternoon. He said: “Falkirk have done great and I’ve been aware of them and exactly what they have been doing. Everybody has spoken about ourselves and Rangers. “Just as everybody was speaking about Rangers in the first weeks of the season and we just went along, Falkirk have done the same while everyone has been focused on Hibs and Rangers. And they are right there. “They deserve a lot of credit for that. Falkirk are a big club, they are one of those who you could say could go up and compete at that top level. They have a big squad and a lot of experience and some very good players. “We are going to need to be as good as we have been all season to get a result on Saturday. “Over the course of the season I think it will be us and Rangers at the end. I think our squad will provide that strength in depth as the season goes on.